Broad low pressure troughs produced moderate falls in northern and central Australia, while a deep low pressure system off the New South Wales coast produced locally heavy falls in Sydney, the Illawarra and Central Tablelands districts. The highest weekly total was 222 mm at Faulconbridge in the Central Tablelands of New South Wales. 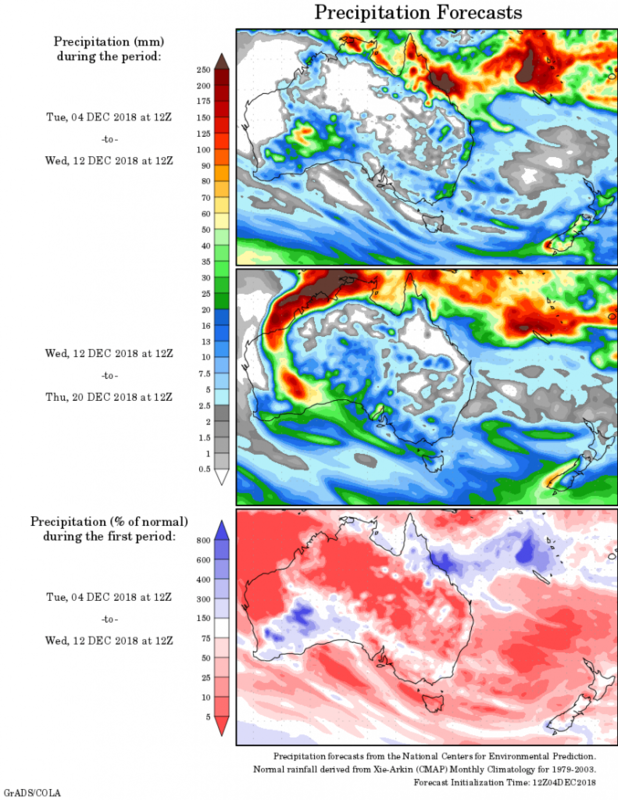 Past seven days: In the first part of the week, an elongated trough of low pressure extended around the continent, stretching along the west coast of the continent, around the north, and into New South Wales. The trough was linked to a vigorous cold front associated with a developing low pressure system slowly moving away from eastern New South Wales into the Tasman Sea. Thunderstorms and moderate falls were recorded in the Kimberley in Western Australia, across the Top End in the Northern Territory, parts of the Gulf Country, and in northern Queensland. Storms produced scattered moderate falls in parts of southeast South Australia, northern Victoria and northwest Tasmania, with heavier falls across central to eastern New South Wales. The offshore low pressure system intensified, and associated severe thunderstorms produced localised heavy rain and flash flooding in Sydney, the Illawarra and Central Tablelands. In the middle of the week, isolated showers and thunderstorms produced moderate falls over far north Queensland and around the Darwin-Daly district in the Northern Territory, associated with surface troughs in the area. An area of low pressure formed on the trough, located over central Western Australia, and triggered scattered thunderstorms from the Kimberley region down through eastern Western Australia, and into northern South Australia. Thunderstorms and showers associated with the trough produced moderate falls through the central interior and north of Western Australia late in the week. During the last part of the week, a cold front and associated cloudband linked to a low deep in the Southern Ocean produced light to moderate falls in southeast South Australia, southern and northeastern Victoria and Tasmania, with widespread light falls across the southeast quarter of South Australia and remainder of Victoria. A westerly flow in the wake of the cold front continued to produce moderate falls in western Tasmania. An active area of showers and thunderstorms in the north tropical and central Queensland coasts developed in the vicinity of a surface trough, generating moderate falls at the end of the week. Rainfall totals in excess of 100 mm were recorded in a small area of western Tasmania, and parts of the Illawarra and Central Tablelands districts in New South Wales. The highest weekly total was 222 mm at Faulconbridge in the Central Tablelands in New South Wales. Rainfall totals exceeding 50 mm were recorded in parts of the Top End and Gulf Country in the Northern Territory; pockets of Western Australia’s central interior and across the border in the southwest of the Northern Territory; in New South Wales in the Central West Slopes and Plains, and an area from the central to southeast coast and adjacent inland regions; and most of western Tasmania. Rainfall totals between 10 mm and 50 mm were recorded across most of the Kimberely and in central inland districts of Western Australia; across much of the north and west of the Northern Territory; the Gulf Country and northern Peninsula, and pockets of the central to northeast coasts of Queensland; much of central to eastern New South Wales; west coast, central and eastern parts of Victoria; areas in the southeast and northwest of South Australia; and nearly all of Tasmania. Little or no rainfall was recorded in remaining parts of Western Australia, the southeast quarter of the Northern Territory, most of the southern half of Queensland, northern and western New South Wales, far northwestern Victoria, and most of pastoral South Australia.